This project is funded through the United States Fish and Wildlife Service (USFWS )Anadromous Fish Restoration Program and is one example of how FFC effectively partner s with a consortium of public and private interests. 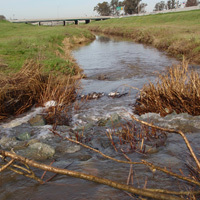 Partners on this project include Stockton East Water District (SEWD); California Department of Water resources (DWR); Department of Fish and Game (CDFG); USFWS; NOAA Fisheries; United States Army Core of Engineers (USACE); and University of the Pacific Biological Sciences Department. The Lower Calaveras River has been designated critical habitat for threatened Central Valley Steelhead and essential habitat for species of concern Fall-Run Chinook. Fish passage has been identified as a primary limiting factor for salmon and steelhead in the Calaveras River and population numbers are expected to increase once passage opportunities are improved. The LCR Anadromous Fish Barrier Removal Project’s goal is to replace or retrofit up to four migration barriers between river mile 6.5 and 18.7 which will increase opportunities for salmon and steelhead to access the quality spawning and rearing habitat located above river mile 24. 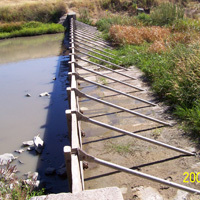 Budeselich flashboard dam is the most downstream of the four structures is the first to be modified for improved fish passage. The structure will be retrofitted with a series of boulder weirs to increase depths over the dam and overcome the steep channel slope. As funding becomes available the partners will continue to address the remaining barriers to fish passage in the LCR.